Below are pictures and a letter from Seymour's last owner, Kris Mann, who gave Seymour to Jenifer because he was screaming too much and Kris just had a baby and couldn't give Seymour as much attention as she previously had. 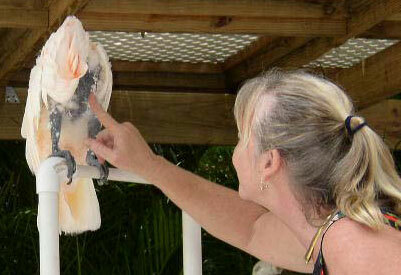 The included pictures of Seymour show his progress with growth of his feathers. We will add more and more pictures over time. 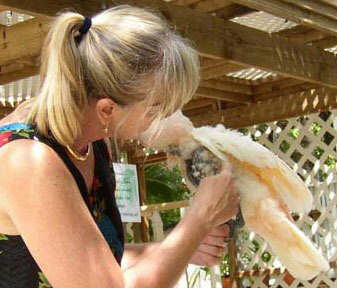 To help Seymour and others like him Join World Parrot Mission here. Seymour was a wild caught bird. It is speculated that he was taken from the nest as either a fledgling or a very young bird. No one is sure of his exact age but it's estimated that he is around 15 or 16 years old. Nonetheless, you know it must have been a very a traumatic episode in his life. He was taken away from his parents and from his native God given home and probably placed in a burlap sack (if he was lucky. 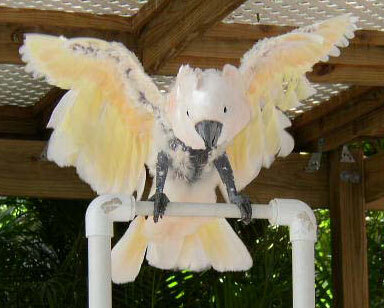 I've heard of birds being sealed in pvc pipes for shipment) and handled roughly. Somehow, he allegedly wound up in a pet store and then in the home of a single man. He was a truck driver and was on the road most of the time and couldn't give Seymour the attention that he required. In fact, that was probably one of the loneliest time in Seymours life. Here he was, fresh out of the jungle and he's left all alone in a cage in some guy's apartment for weeks at a time. I don't know the details. I'm only speculating as to how his life must have been belonging to a single guy who drove a truck for a living. He is responsible for naming him, however. He had Seymour for approximately two years before selling him to Jean and Bill Wilshere. They are a lovely couple who used to live in Pompano Beach, FL. 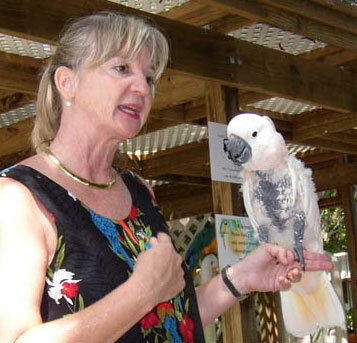 They had lots of cockatoos and in fact used to breed sulfur crested cockatoos. They became very attached to Seymour, especially Mr. Wilshere (Bill). Being an elderly couple, they decided to retire and move to Lake Wales, FL where the lifestyle is slower. They moved to a beautiful retirement community on a lake and kept the birds outside in a large screened patio area. They had enormous cages built on this patio for the birds. 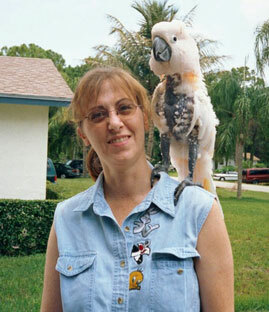 Seymour was very closely bonded with an amazon named Pico. I believe he was a yellow naped amazon. Pico and Seymour were in an aviary together and loved to preen each other. Then one day the neighbors complained because Seymour made too much noise. 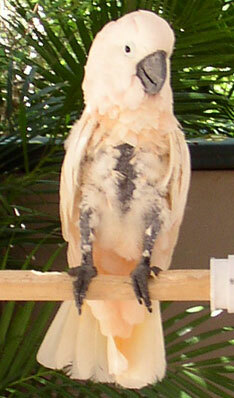 He would squawk in the mornings and in the evenings (as all birds naturally do unless taught otherwise). So in order to keep the peace with the neighbors this very sweet couple made the very difficult decision to find a new home for Seymour after having him for approximately 7 or 8 years. Poor little Seymour then found himself separated from his beloved Pico, his flock and his much loved owners. It's amazing how tame he actually is. That's where I come in. I drove up to Lake Wales to pick him up. I had never met Seymour. He was completely plucked except for his wings, tail, and head. The Wilshere's said that he had started plucking a few years prior and there was nothing physically wrong with him so they just ignored it. I took him home and he was very depressed for a while. I didn't really know what I was doing either, of course, when I acquired him. I had Seymour about a year or so when I heard about Jenifer Dermer. I went to see her at a program she did at Barnes & Noble in Aventura, was very impressed, called her, she came to my house and met Seymour and the rest is history. Now he's with Jenifer and is finally happy and growing his feathers back. My sweet little boy. I"m so happy he is with her and that he is doing well. I miss him but of course I only want what is best for him and I have absolutely no regrets whatsoever. Jenifer, I just want to let you know that I think you are quite simply the most amazing woman I have ever met. God has definitely gifted you with this amazing sense of responsibility, committment, and uncanny way of getting into a birds head. 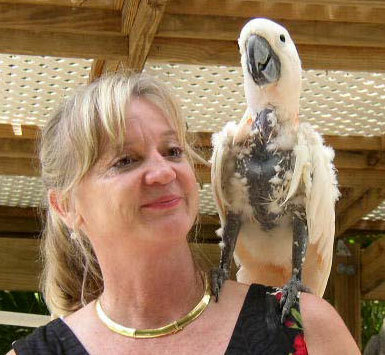 You are able to make a bird so much more at ease because the birds KNOW that you understand them. Can you see his feathers touching? Seymour's pink feathers are starting to show!